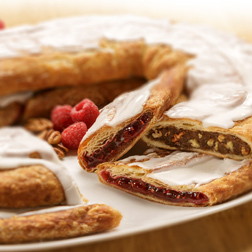 "Racine Danish Kringles" and the Racine Danish Kringles logo are the federally registered trademarks of Racine Danish Kringles, Inc. (RDK Corp) and are protected by both federal and state trademark and unfair competition laws against the unauthorized use of any mark determined to be confusingly similar thereto. The trademarks themselves may not be used without the prior express written permission of RDK Corp in any manner including in any web site whether in a domain name, text, metatag, or otherwise. This web site including the text and graphics as well as the Racine Danish Kringles logo are also protected by federal copyright and may not be copied or reproduced in any manner or in any tangible medium of expression without the prior express written permission from RDK Corp.